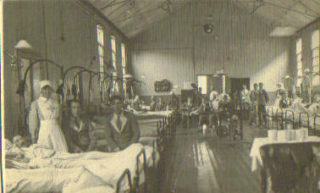 Napsbury Military Hospital, Ward M6, WW1. 19/08/1917 to 28/09/1917. | Napsbury | Out of Sight, Out of Mind? You are here: Home>Hospitals>Napsbury>Napsbury Military Hospital, Ward M6, WW1. 19/08/1917 to 28/09/1917. Is this Napsbury or York? Taken on 28th June 1917 day before going to front. Kevin Warcup via Pat Barrett of Kingston Upon Hull. 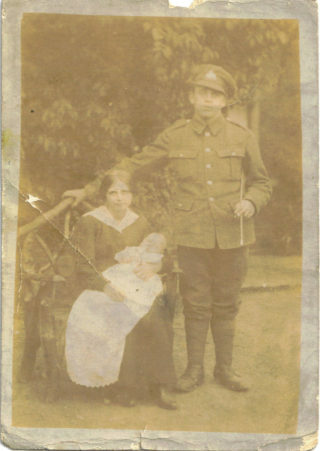 Pte Albert E Warcup with wife Queen H Warcup and son Arthur A W Warcup 1917. My granddad – 41532 Pte Albert Edward Warcup – was gassed near Nieuwpoort, Belgium at the end of July 1917 along with over 200 other men of the 2nd Battalion of the Royal Inniskilling Fusiliers. He was eventually taken to the No2 Australian General Hospital in France, and later in August evacuated back to England and taken to Napsbury Military Hospital, where he was looked after on Ward M6. I know this because my granddad wrote it all down in his War Diary. Granddad also sent home a couple of pictures from Napsbury – one of these being a picture of the ward. He wrote on the back of the postcard, pointing out to family back home in the East Riding of Yorkshire, that he is in the bed on the right of the picture. The second picture of my granddad I believe contained more soldiers, but granddad had his part of the picture enlarged and the rest of the men cut from the picture. I would love to be able to find the original picture with all the men who were around him. I have both the original pictures. As an update to my article I meant to post these pictures ages ago and then forgot to do it. I believe that the first picture could be of Napsbury but it could also be York Military Hospital but I will let those people who may know be the judge of that. 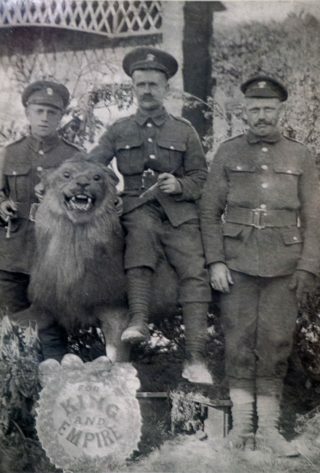 I have also added some other pictures of my granddad before he went to France/Belgium one just after his training at Etaples and the day before he went to the front, he is pictured on the left in the picture with the lion. 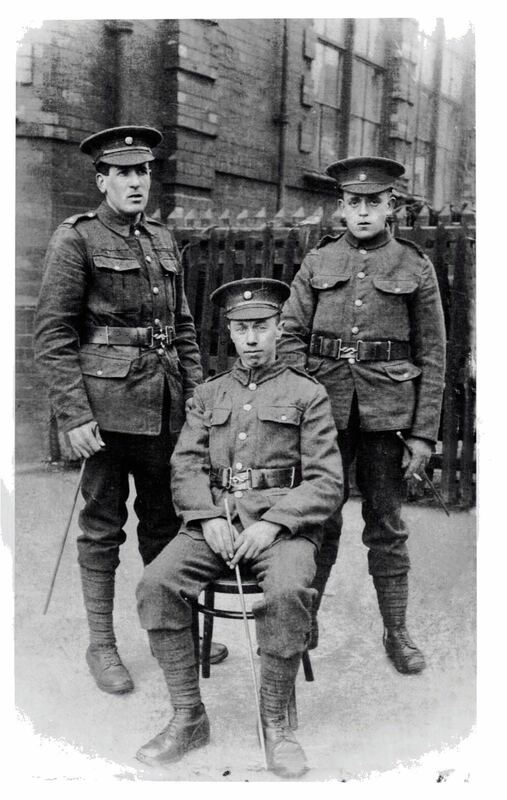 His friend Pte Abraham Harrison of Cottingham in the East Riding of Yorkshire and Pte Albert Spencer on the right from Wollaston-road, Irchester. 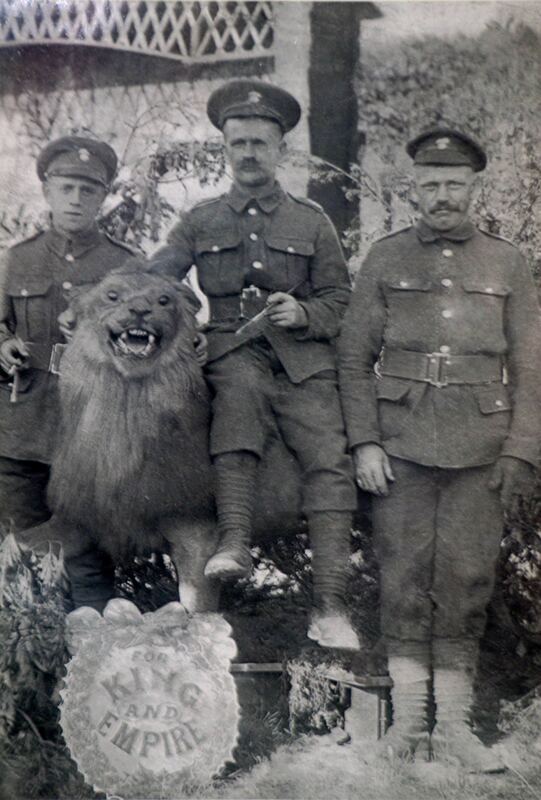 All served with the Royal Inniskilling Fusiliers and made it back from World War 1. The last picture is of my granddad on sick leave from York Hospital, he is pictured with his wife Queen Henrietta Warcup and their son Arthur Albert William Warcup. This page was added on 04/05/2013. Having had a conversation with site owner we think the ward picture may not be Napsbury. 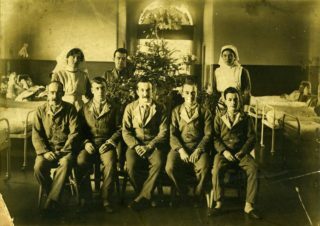 I don’t think my granddad was still a patient at Napsbury around Christmas 1917/18 but could have been in York Military Hospital as I know he was admitted to York at some point. Any experts on York Military Hospital out there?